While most teams have already revealed their new threads for upcoming season, with 2016’s first WorldTour race in the Tour Down Under just a few weeks away, newly named Team Dimension Data have yet to reveal any sign of their new kit. Having changed over from the name of MTN-Qhubeka for the new season, and making marquee signings like Mark Cavendish, the African squad was always likely to make a step away from the distinctive black and white stripes that they wore in 2015. And now the sports governing body, the UCI, has given us the first glimpse of the kit on their website ahead of any official reveal by the team. The new, mostly white design, is hardly going to make waves, but its simple and clean design is far from offensive (let’s just hope they pair it with black shorts and not white). 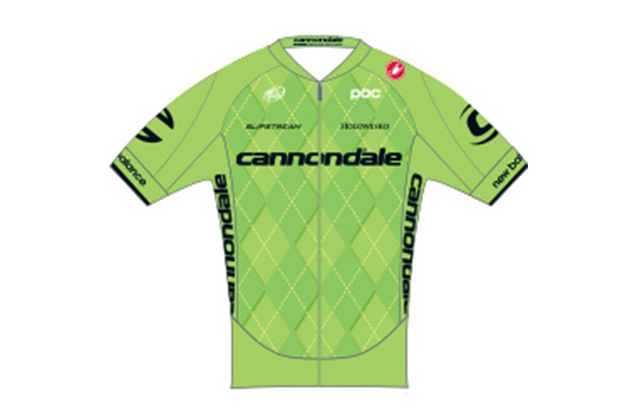 Another team yet to reveal their kit was Cannondale, who’s new design was also uploaded to the UCI site. Think less black, more green for next year, but the argyle pattern they’ve become known for remains. You find images of all other new team kits over at our dedicated page, with Giant-Alpecin the last team yet to show any sign of a renewed kit.